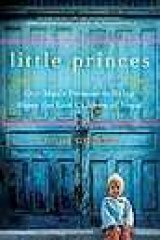 Reading "Little Princes: One Man's Promise to Bring Home the Lost Children of Nepal" (William Morrow, 304 pages, color photos, index, $25.99) restored my flagging faith in humankind, just a little. I'd like to nominate Conor Grennan for a Nobel Peace Prize for his devotion to a cause that led him to found Next Generation Nepal, a non-governmental organization dedicated to reuniting Nepal's lost children with their parents..
Trading his day job for the adventure that comes from traveling around the world, Grennan began with what was supposed to be a three-month term at the orphanage. He was initially reluctant to volunteer, not being sure that he was cut out to deal with children. He soon discovered that he bonded with children of the orphanage who accepted him as a big brother. He also discovered that what he thought were orphans weren't orphans at all in the usual sense: they were the prey of child traffickers who promised their parents in remote villages that they would shelter the children from the civil war, protect them from riff-raff militia who used the youngsters to fight. The traffickers sold many of the children to people who used them as servants. Others were abandoned on the streets of Kathmandu to fend for themselves. The traffickers didn't do this for free: The parents had to pony up big fees. He began corresponding to Liz Flanagan by email and soon she promised to visit him during her stay in India. Meanwhile, Grennan risked his life on a rugged journey to Humla, a remote region even by Nepalese standards. He went to the region to locate the parents of seven children and tell them that the children they had surrendered to traffickers were safe. His account of the return to Kathmandu reads like something out of Jack London. Will he make it back in time to meet Liz, a beautiful blonde whom Grennan suspected would be the only woman for him? Or will he succumb to the hazards of the journey or be too late to meet her. After all, she was only going to be in Nepal for a couple of days around Christmas, which is just another day in Buddhist and Hindu Nepal. Read "Little Princes" for the adventure, for the romance, and most of all for the joy of Grennan's -- and Liz Flanagan's -- bonding with the rambunctious, resilient children who would challenge and reward both of them in ways they couldn't imagine. More often than not, my eyes misted up as a read this wonderful book. Conor Grennan volunteered in Nepal at the Little Princes Children's Home in the village of Godawari in 2004. He would eventually return to Nepal to launch Next Generation Nepal (NGN), a nonprofit organization dedicated to reconnecting trafficked children with their families in postwar Nepal. Grennan is a graduate of the University of Virginia and the NYU Stern School of Business. He lives in Connecticut with his wife and son, Finn, and returns periodically to Nepal.